What is effective teacher-centered coaching? Quality teaching practices influence student achievement. Instructional coaching practices influence the quality of teaching. Instructional coaches are an incredibly important part of the student achievement equation, and because of this, instructional coaches (anyone who coaches teachers, regardless of official position) should be well informed regarding coaching best practices. The content provided here is specifically related to teacher-centered coaching. Teacher-centered coaching refers to a coaching strategy that is focused on teacher actions in the classroom, versus student-centered coaching, which focuses on looking closely at student-level data. When coaches make intentional choices about which approach to take, they honor both teachers and students by providing the most effective and efficient route to improving student achievement. Both approaches are valuable, and both will be addressed in the professional learning pack. I can explain the characteristics of effective teacher-centered coaching practices. Both types of coaching, teacher-centered and student-centered, happen in a cycle, as illustrated below. Instructional coaching in EL Education schools is focused on evidence of student achievement and engagement connected to the instructional choices of the teacher. 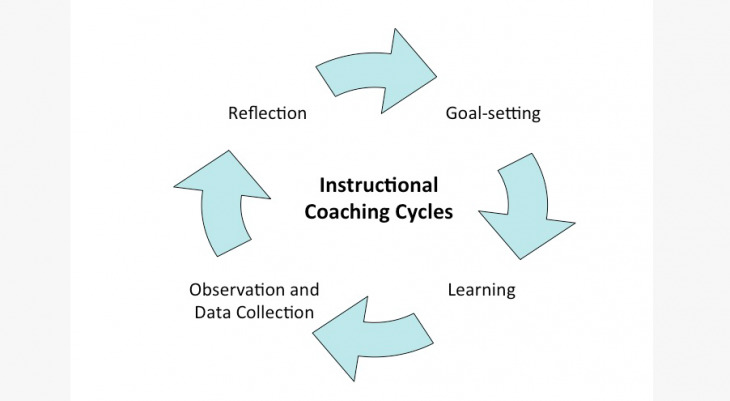 Coaching involves an ongoing cycle of goal-setting, learning, observation, data collection, and reflection. However, the beginning point in this cycle is not the same for every teacher. Some coaching relationships may enter the cycle at the learning stage, while others might enter through data collection or reflection. What are the benefits of using a robust coaching cycle that includes each component? In what ways might the cycle change when delivering student-centered versus teacher-centered coaching? Establishing Coaching Relationships on a Foundation of Trust: An EL Education document explaining the role of trust in coaching as well as initial steps toward building a trusting relationship. Setting Coaching Cycle Goals: An EL Education document explaining the role of goal setting in coaching, as well as how to support teachers through the process of establishing SMART goals. Coaching: Goals, Planning, and Results: An EL Education note-catcher that aids in supporting the planning of goals for students, the instructional strategies to achieve the goals, and the outcome of those actions. This link will download to your computer. Coaching Observation Tool: An EL Education document that offers possible pre-observation and post-observation questions, as well as space to document the observation itself. This link will download to your computer. Supporting Learning Within Coaching Cycles: An EL Education document explaining the various ways that a coach can support a teacher, as well as additional professional development opportunities to consider. This activity provides the opportunity for you to practice observing a classroom implementing Common Core literacy instruction, followed by crafting feedback to the teacher that will promote change and growth in practice. Please keep in mind the practices for giving effective, descriptive feedback. Note: For the purposes of the activity below, these videos were intentionally taped and edited to highlight opportunities for growth. 1. Thoroughly review the Instructional Practice Evidence Guide. Courtesy of Student Achievement Partners (2014, July 9). Instructional Practice Guide: Coaching. If you are working through this with colleagues, use the guide as a resource to clarify any questions that arise. 2. View either the elementary or middle school video below. While viewing, complete the first page of the Instructional Practice Evidence Guide. Feel free to view the video as many times as necessary to capture necessary evidence. 3. Now that you have identified the strengths and opportunities for growth in the lesson you viewed and completed the first page of the evidence guide, craft the feedback that you would give the teacher. Write it out in a script format, word for word. Refer to the content on the Giving Feedback page as necessary. Discuss both strengths and opportunities for growth. Keep the feedback aligned to the evidence guide you used for collection. Now that you have scripted the feedback you would give to the teacher, if you have the opportunity to work with colleagues, get ready to share your feedback using the Praise, Question, Suggest Protocol. This activity is a role play to help you experience receiving feedback and practice crafting and giving feedback that promotes growth in adults. If you do not have a small group or partner to work with, move directly to Synthesize Your Learning. Get into small groups of three or four people. One person gives the growth-producing feedback to someone in his or her group as if this person were the teacher in the video. Praise: What is praiseworthy or working well about the type of feedback this person would give to the teacher in the video? Give specific points of praise. Rotate and have someone new present feedback. * For more detailed directions with time, see the full protocol, linked above. What new understanding do you have regarding teacher-centered coaching? Will these materials influence your coaching of teachers? If so, how? How will you put them to good use? How will you know if you are successful in making these changes in your coaching practice? What will success look like?